Another solid week for local players in the pros. Antoine Hoppenot played with Harrisburg City, and provided a goal and an assist in two games. Jeff Larentowicz was solid in the midfield play for the Fire to help them secure a much needed three points. 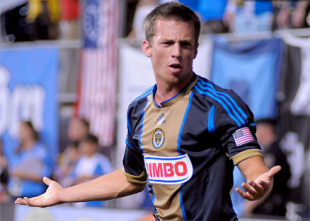 Andrew Wenger dished out what would ultimately be the game winning assist for the Union, his fourth as a Union player. And lastly Bobby Warshaw is now playing for BAERUM SK, a Norwegian team that plays in the second division. He earned his first cap for the squad over the weekend. Russell Canouse, M, Hoffenheim —Season Complete. League: 24 games. Bobby Warshaw, M, BAERUM SK — Came on in 84th minute in win over Hodd. League: 6 games. Congrats to Antoine Hoppenot for scoring a goal. Make sure to make a hattrick next time.